Diabetes is a common condition where there is too much sugar in the blood. It can be treated, but even with treatment, people with diabetes have a higher risk of developing eye problems. When you eat certain foods, your body turns the foods into glucose (sugar), insulin then helps your body store the glucose allowing it to be released gradually maintaining a steady level of glucose in the blood. Diabetes is a condition where there is too much sugar in the blood. This happens because the pancreas doesn’t produce enough insulin, or the insulin doesn’t have the effect it should. People with diabetes can have eye problems due to leaky or blocked blood vessels in the retina, the layer at the back of the eye, over time this can cause sight loss. The longer you have diabetes, the more likely you are to develop eye problems. If your diabetes is poorly controlled this also increases the chance that you will develop diabetic eye disease, also known as diabetic retinopathy. If you have diabetes you may not notice the signs or symptoms of early diabetic eye problems. You should get your eyes checked regularly to pick up any changes. In almost all UK areas, a screening programme will invite you to get an annual eye check using digital photography for diabetic eye disease if you have diabetes. It is extremely important to have this done. Laser treatment of the problem blood vessels can prevent further sight loss for nine people in 10, but improvement in sight which has already been lost is only possible for a minority. People with diabetes are twice as likely to develop glaucoma as other adults and also tend to develop cataract at an earlier age. Diabetes is relatively common, with around 3.2 million people in the UK being diagnosed with the condition and it is estimated that a further half a million people with the condition have not been detected. Diabetic retinopathy remains the leading cause of blindness amongst working-age adults in the UK and most of the developed world. Type 1 diabetes is when the cells that produce insulin are destroyed by the body, which means you cannot produce any insulin. It usually starts in childhood, and almost always before the age of 40. It is treated by injections of insulin and a healthy diet and lifestyle. Type 2 diabetes is when the body doesn’t produce enough insulin or the insulin produced is ineffective. It usually starts over the age of 40, but can start from around age 25 in African-Caribbean and South Asian people. It accounts for 17 out of every 20 cases of diabetes. It may be possible to treat with a healthy diet and exercise, but medication and/or insulin may also be needed. These problems are caused by high sugar levels. The kidneys try to pass out the extra sugar which can make you urinate more and feel thirsty. You feel tired because your body is not getting the benefit of the food you are eating. The weight loss takes place as the body uses its fat reserves instead. If you have some of these symptoms you should talk to your GP. In general, you have a higher risk of problems if your diabetes is poorly controlled. Raised sugar levels cause changes to blood vessel walls. This is a particular problem in the eye as the blood vessels are small and thin. Diabetic eye disease is the most common complication of diabetes. Diabetic eye disease develops gradually over time – the longer you have diabetes the more likely you are to have eye problems. Nearly everyone with Type 1 diabetes will have diabetic eye disease 20 years after their initial diagnosis. Around six people in 10 with Type 2 diabetes show signs of eye disease 20 years after diagnosis. Diabetic eye disease starts with small changes to the blood vessels at the back of the eye. You can’t see these changes yourself but an eye specialist can detect them when using a bright light to look inside your eye. There is a national screening programme where digital photos of the back of your eye are taken regularly so specialists can detect any early changes. Initially, tiny swellings appear in the walls of the blood vessels that carry nutrients to the retina, the layer of cells at the back of the eye. These swellings are known as ‘microaneurysms’. Fluid can leak through the weak blood vessels: this can be a clear fluid leak or a leak of blood. 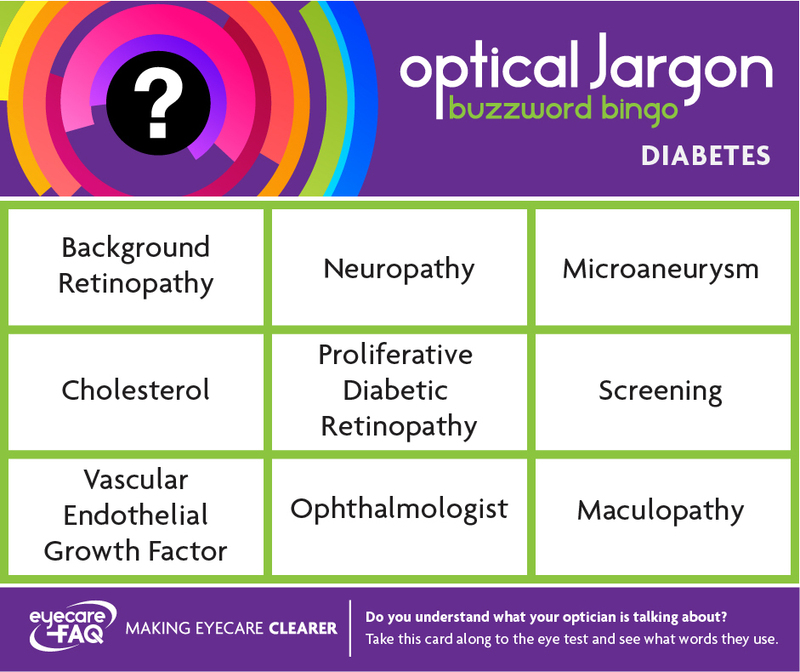 At this early stage, known as ‘background diabetic retinopathy’, there is no threat to your sight, but it is still important to attend your appointments, as advised by your specialist, to monitor the condition. After these initial swellings, some of the retinal blood vessels can become blocked which leads to parts of the retina becoming deprived of blood. The retina then sends out signals to the body to grow new blood vessels, but these new vessels are fragile. They grow and attach themselves to the surface of the gel inside the eye but leak easily, causing scar tissue to form which is what leads to severe vision loss. This is known as ‘proliferative diabetic retinopathy’. People with diabetes can have problems with the macula, the central part of the retina that allows you to see small details. Diabetic retinopathy that involves the macula can cause problems with your central vision. The leaky blood vessels in the retina can also cause extra fluid to leak into the macula which makes it swell. This makes vision blurred. It can happen at any time but is more likely to happen if you have had diabetes for a long time. If you have diabetes and your vision becomes blurred, you should contact your diabetic specialist immediately. If you know you have diabetes and are aged 12 or over you should be invited to a special eye test at least every year, how often you are offered an appointment will depend on your own particular circumstances. Some people attend for a diabetic eye check at a high street optical practice, while others may be seen in a hospital clinic or community screening centre. After the tests your eyesight will be blurred until the drops wear off, you will have to arrange an alternative way home as you won’t be able to drive. Read more about the national programme for diabetic eye checks at http://diabeticeye.screening.nhs.uk/. If the eye specialist suspects certain problems, they may refer you for further tests. A test called a ‘fluorescein angiogram’ uses dye to show up leaky blood vessels at the back of the eye. In this procedure, eye drops are used to get a clear view of the back of your eyes while a special dye is injected into your arm and photos are taken as the dye passes through the blood vessels at the back of the eye. The eye specialist will be able to see where fluid or blood is leaking at the back of the eye. If mild or early diabetic eye disease is detected you are unlikely to be offered treatment. Instead your eyes will be monitored every few months. If you have new blood vessels growing at the back of the eye, laser treatment is used to treat them. Laser treatment usually can prevent diabetic eye disease getting worse or at least slow down the rate of further visual loss; but can only occasionally restore lost sight. If you are offered laser treatment, bear in mind you may need more than one treatment session. You will attend your appointment for laser treatment at an outpatients clinic and you won’t need to stay overnight in hospital. The specialist will give you some eye drops to widen your pupil so they can see the back of the eye in detail. More drops will numb the surface of the eye and a contact lens will be put onto the eye’s surface. The specialist administering the laser treatment will focus the laser on problem areas at the back of the eye and make tiny burns. This is done to seal leaks and prevent new blood vessel growth. The treatment may be uncomfortable but only some types of treatment cause pain: the specialist will tell you if you are likely to need pain relief. Because the laser is very bright your vision will be blurred immediately after the operation and you may also have a headache. Some people also notice that they have some black spots on their vision after treatment. If you have laser treatment your peripheral vision can be affected so you must let the Driver and Vehicle Licensing Agency (DVLA) know when you have had the treatment. Newer treatments, including injection of steroid preparation or anti-VEGF (vascular endothelial growth factor) into the gel in the back of the eye, are being explored and may be offered to you if appropriate. If your specialist has spotted changes to the macula you will be offered laser treatment. If you have a bleed into the gel in the eye you may need surgery. The bleed can cause scar tissue and sight loss so it can be necessary to remove the gel. For a small number of people the growth of new fragile blood vessels can cause the retina to become detached. You would then need surgery to reattach the retina.